A new type of window for my Steampunk Corridor range. This section will allow you to turn your corridor section into a bunker. 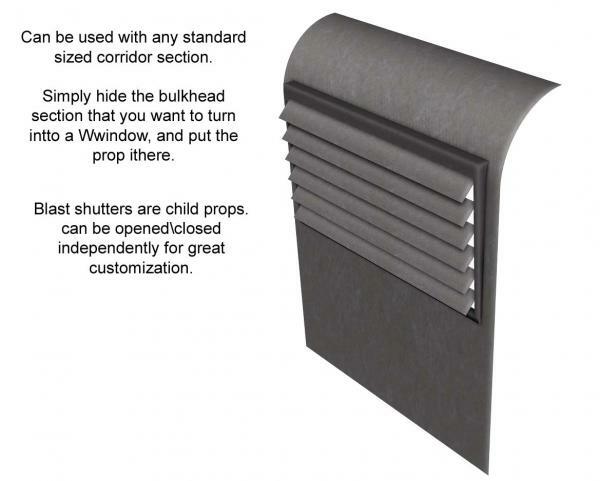 This prop was designed to be used with any of my Steampunk Corridor sections that use the standark Bulkhead template. Simply select the corridor section and hide the bulkhead using the Opacity settings in DS\Material Room in Poser. Then put this section in its place. Free for non commercial use, if you would like to use it commercially, please consider donating (Please See Readme). Do not redistribute. darksideemperor67 (4 years ago) Inappropriate? I have some suggestions like a docking bay and hanger bay a domed room like for an underwater city with a few entry coridors and one with a shaft for and underground base and a central shaft and a curved corridor and a large room for many uses. pwiecek (5 years ago) Inappropriate? 1 a simple flat wall to use between stacked pieces. Not really requests because I'll probably make/find them. I've always loved this set, but the newer detail pieces are the best. They'll make great railcars to go with Spirit of Punk. Thank you for these good looking sets. They'll surely come in handy. palin11 (7 years ago) Inappropriate? Thank you for these, they are amazing! If you load the geometry using the .PP2 file it positions and angles the shutters for you. Elowan (7 years ago) Inappropriate? A very nice addition. Thanks!